When Pj and I were first dating, we loved to go antiquing together. We'd hop in the car on a Saturday morning and make a day of it, whether it was a road trip or a long walk around a local antique mall. We got married, had kids and we kept doing what we love. Antique shops can be scary places for parents of tiny ones but in our few years of taking kids with us, we haven't had any disasters. Even with a wild 3 and 4 1/2 year old, it has continued to be one of our favorite family outings. 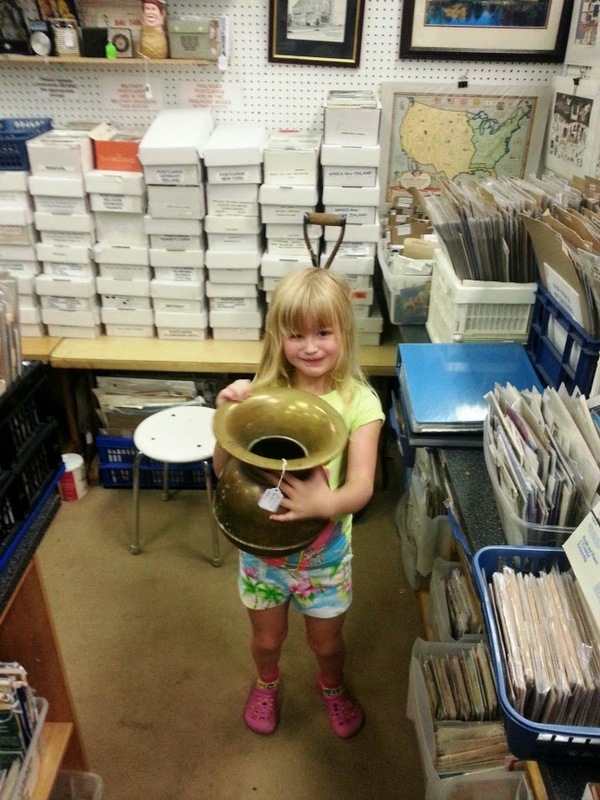 Here are our tips for antique shopping with small children. I remember carrying my little Olivia around the antique mall in her Moby wrap while I looked through old post cards. When we had Rhys, he would nap in the stroller while Olivia walked with Daddy. 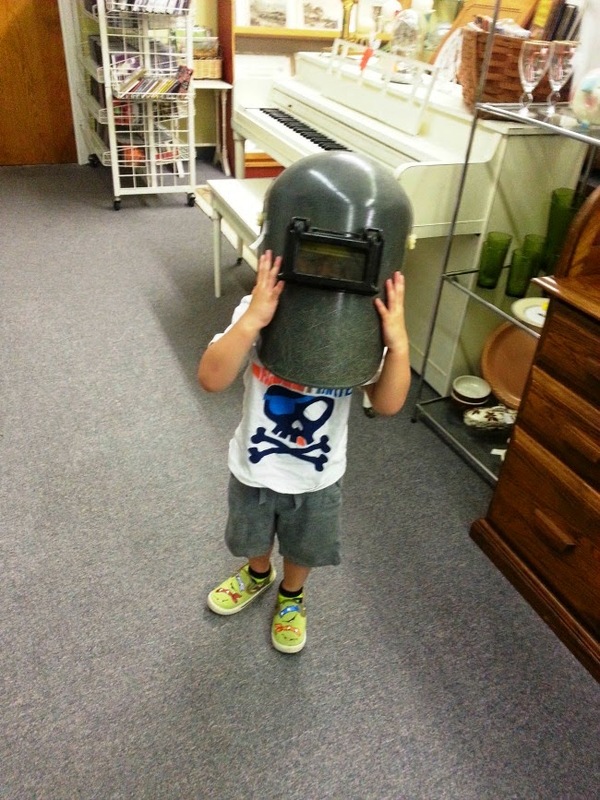 Teach them at a very young age that antique shops are amazingly fun places but that it's important to be careful. We look at all of the pretty breakables, delicate jewelry and interesting treasures and we touch them. Little ones are curious and they want to touch as well. Imagine walking through an antique store without being able to touch a thing. I'd cry and fuss too! Our antique shop trips are great opportunities to learn and explore. Allow them to touch things, hold things and investigate. Talk about what things are, how they were used back then and how things are different now. Once Olivia was old enough to walk on her own while holding hands, we started a very important "ask before touching" rule so we can help her pick things up and explore them and return them to the shelf without breaking them. They're still little and we work on the "ask before touch" rule every time we go to an antique shop. We like to go antiquing early in the day. The kids have had a good breakfast, they're feeling happy and ready to have some fun. If we go too late in the day, they're crabby and needing naps and we'll find ourselves not having any fun at all. Plan your trip when the whole family is feeling adventurous and well rested. The best part about antiquing is that its very tiring so they'll probably nap on the way home! Most antique malls have basic rules such as no food or drink and no large bags. Make sure that everyone has had a bite to eat before entering and stick a diaper and small pack of wipes in your purse if they don't allow large diaper bags.We have one mall that claims to not allow large bags but I've always just shoved mine in the bottom of my stroller and no one has given me any grief about it. If you think you'll need your bag, they may even hold it behind the counter if you ask. One of my local favorites has a small nook with tables, chairs and vending machines with snacks and soda. Sometimes, kids can get a little sensory overload so this is a great spot to sit and re-group before finishing up. 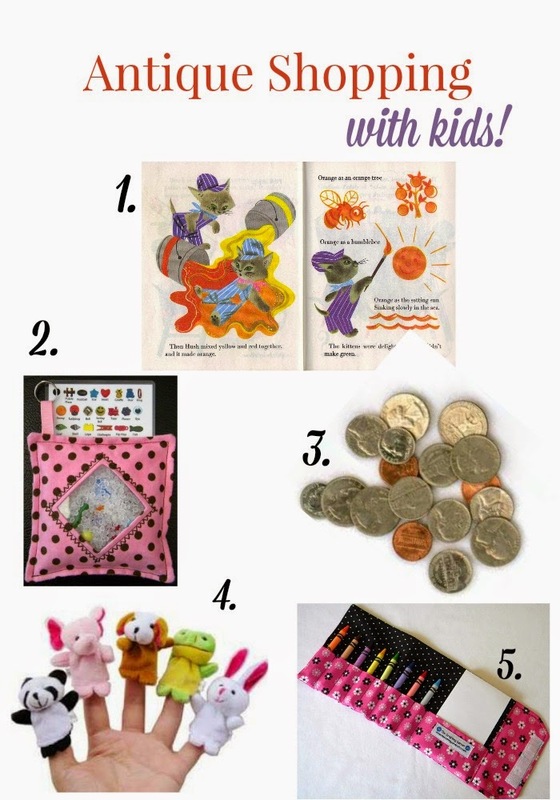 I have a bag that I keep in my trunk that includes a few small board books, quiet but fun toys and extra change. They sit in the double stroller and read or play with toys quietly while we look around. Some of our favorite antique malls have candy machines by the door and they always have a vendor with $1 beanie babies and mardi gras necklaces, which my kids love! When we enter the store, I remind them that treats are for well-behaved kids and if they can follow the rules, we'll let them pick out a little something or get some candy on the way out. Sometimes we bring our tablets, which are loaded with educational kids games, puzzles and such. Since Olivia was a baby, I always went antiquing with Pj or my best friend, Amanda. If one of the kids started to lose their marbles, I'd have another grown up to help get them out of there. 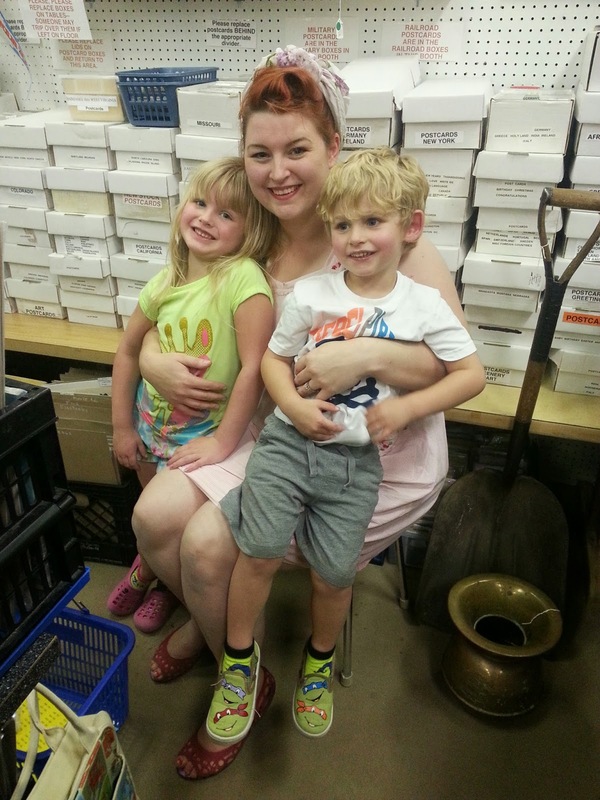 A few weeks ago, I took the kids antiquing by myself for the first time and it was actually really wonderful! Rhys rode in our small stroller and Olivia walked along. We walked from our house to two antique malls. Since each mall was very small, I think it helped them to not get too antsy. Well, and Rhys found a Spiderman book that kept him happy for quite a while! This is where it helps to have help. Its hard to look at everything and keep a very close eye on little ones. Pj and I usually take turns looking at booths and looking after kids so everyone has a good time. When I find a booth that I need to spend some time at, he takes our wild boy and Olivia hangs out with me since she's old enough to behave while I look through boxes of buttons and such. A stroller or baby carrier helps keep control over little hands. I've learned that those toddler arms can stretch like Gumby so I'm very careful about where I park the stroller too. Get to know the antique shop owners and pop in frequently. I'm sure that owners see our sticky, drooly beasts and cringe but when they see how well behaved and in control everyone is, they'll be pleasantly surprised and happy to see you come back! When we started going to antique malls on date nights, our ladies started to get upset that they missed out on seeing the little ones and giving them stickers at the register. We have one lady who is constantly in a crabby mood but when she sees those kids, she always smiles and chats with them. Frequenting local stops helps the kids to become familiar with the scenery and it may not be such a sensory overload for them too. They learn early that there are certain expectations for antique mall outings and if they behave, they're rewarded with praise, a fun afternoon and a little treat. This week, I visited a local place, just me and the kids and the shop lady looked so irritated when she saw me come in with kids. We stayed for a good hour, looking at things and by the end, she was so impressed with their good behavior that she complimented us and gave them each a kids movie for free, to watch before nap time after we walked home. The most important thing to remember is that children are tiny, curious people, still learning about the world and we must always have realistic expectations of them. I know that my limit with my kids is usually no more than 2-3 stops per day. Anything after that and I'm asking for trouble. I also know that although I've reminded them of the no touch rule 65 times today, I need to keep watching and reminding them throughout our trip. We have a lot of great antique shop outings but every rare once in a while, we have a bad day and we promptly leave when someone has a melt down. Usually, the melt down is a result of me not preparing enough for our trip (no naps, forgot toys at home, I've shopped too long and they're ready for lunch). Be mindful of how they're feeling and try to get on the road before anyone loses their marbles. Have a great time hunting antiques with your littles- Before you know it, they'll be spotting the good stuff before you do! Ours are the world's biggest whingers while antiquing. I have found that a digital camera helps tremendously since Miss 6 was Miss 4 onwards. She would antique for HOURS if she got to photograph every single thing she liked. For Miss 13, she is quite happy to be dumped into a chair in a corner with a book. I also bring my kids to second hand stores and flea markets. The teenager has become allergic to them saying they are icky but the younger one loves them and always find something utterly ugly to decorate his room with. Both have been very careful in the stores so I haven't actually needed to stop them from touching. What a great article! We've been bringing our twin girls, who are now 4, to flea markets and antiquing since infants. Granted, we started with incredibly short periods of time, but they now love to explore, always find things they love and things I love no less! They are so much fun to with I have no problem buying them both a little something whenever we go. And btw your kids are just gorgeous.